Lowe's and Home Depot both offer 10% off for Military Members. This is probably one of the most well known military discounts around. There is still a ton of controversy about the discount. I still read on blogs or on facebook that certain stores didn't accept the Military Discount. Lets take a closer look at the details of the military discount for the year 2015.
Who can get the discount EVERYDAY? 4.) Immediate family of options 1-3 above. This includes the spouse and children under the age of 18. What about Veterans who don't qualify under the restrictions above? 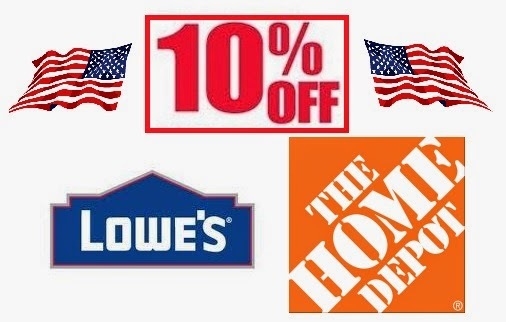 Lowe's states that you can get 10% off on three specific Holidays: 1) Memorial Day, 2) 4th of July 3) Veterans Day. In order to get the discount you must provide valid military ID (such as Form DD214). So to recap, I think they are saying if you are a veteran but didn't serve for 20 years or have VA benefits then you DON'T qualify for the "everyday military discount" but rather the "Holiday Military Discount"
Home Depot has a very similiar policy to Lowes. They give the EVERYDAY 10% military discount to anyone that is Active Duty but have tighter restrictions on Veterans. It appears like you need a "Specific DOD-issued ID". They do have a several days like memorial day or the 4th of July where you can get the 10% discount without the DOD-issued ID . I like to order my items online at HomeDepot.com and then pick them up in store. When you order a product online for local pickup and they would be able to apply the Military discount at the store when you pick it up. A new change to their policy is that the 10% is limited to $500 worth of products. This means that the maximum you can save per trip is $50. Home Depot has further changed its 10% discount, since it does not apply to everything like it use to. Dang, I had no idea they changed things again! What does it not apply to anymore? 4.) Immediate family of options 1-3 above. This includes the spouse and children under the age of 18. this is wrong since there is no such VIC ID card for spouses or family members.Home Depot has it written correctly as to who gets the discounts. There is an id card for retired military spouses. Home Depot does not give 10 % military discount on the 4th of July in Topsham Maine.I need a new roof and went to the register with shingles,pressure treated wood. nails and screws. About 500 dollars worth.Cashier said these products were not eligible for military discount.I did not purchase. Asked what was eligible for military discount.Said only the computer knows and the only way to find out was to ring it up.I guess they only give the 10% military discount on items you don't need.This is definitely HALL OF SHAME worthy . Either honor your 10% military discount or discontinue your false advertising. The items the discount applies to is determined at the corporate office and entered into the computer system. Neither the checkout clerk nor the store manager knows in advance what will be eligible for the discount and what will not. The 10% discount is not given at Home Depot on items with a margin less than 10%. This is usually commodity-based (i.e. drywall, concrete, etc). As someone who used to sell commodity goods to Home Depot, I know this is the reason. For instance, Home Depot makes about 10-11 cents per sheet of drywall that sells for $9-$10/board. They make their money off of the accessories, tools, and add-on sales to commodity-based products. For anyone feeling slighted over this discount denial, don't. The alternative would be that they raise their prices to support products being discount-driven, instead of lower-priced for all. And as someone who proudly served in the Navy, my service was not done to obtain monetary discounts for the rest of my life. If it's offered, fine. If not, that's okay as well. I'd rather have people respect what I did for my country than feel compelled to discount products that they sell. Anonymous - Well said. As a member of the military I am always appreciative of the support and thanks I receive from the public. However, I did not join the military for thank you, discounts, and freebees. I will accept the benefits of these displays of thanks, but I do not expect them. A good many of our military have not spent a day of service outside an office in the States, yet there are men and women in uniform putting their lives on the line everyday: Law Enforcement, EMTs, Firefighters, and they are not bitching and complaining about $1 off of a $10.00 purchase or even $50 off a $500.00 purchase. To my fellow veterans- be thankful you have a job, benefits and the public thanks - an less so an expectation of entitlement. Thank you very much for clearing that up. I was in Virginia Beach when I first used the 10% discount to upgrade a rental property. They automatically discounted everything! Then I went home and tried to use the discount in Wyoming and Montana, they looked at me like I had 3 heads and somethings were discounted and others weren't. It made no sense. I'm thankful what I got, I just like knowing the rules. I have been shopping at home depot for years now in michigan, it is 10% for everything i have purchased. We can now use our state license which now hat veteran status if you updated and brought in your dd214 papers. As a veteran I to agree that I don't expect freebies and discounts for everything just because I served.....however if a business is really thankful for the service and sacrifice of our past and present members of the military then show your thanks to all that served. It seems to me that these big businesses are getting pretty picky about what can be discounted, how much can be and who can get the discount. Why is it HD and Lowes want to advertise veteran discounts but its not accually for all veterans. Only retired, reserve, disability and active. Are the rest of the Vets who served less than 20 yrs and got out any less worthy of the same thanks as those who served over 20. Lots of vets have served honorably and get out and struggle daily with PTSD and other medical issues that choose not to go to the VA to get an ID. My TX DL shows my veteran status. Lowes and HD both say thank you for your service but you dont qualify for a discount. I honestly dont need or care to get the discount I just think if a business is going to show there appreciation for veterans and active duty then please show it for all otherwise I cant help but think that your veterans discount is geared more towards marketing rather than appreciation. Lowe's has added online service verification that permits military discount via online shopping. They use a 3rd party software that uses name, service and discharge date, if I recall correctly. You have to apply for the military discount to be added to your account online at Lowes.com (you also need a "My Lowes" sticker which is put on the back of your Lowes credit card. Once you have completed the application, you must take your DD214 into the store Service Desk for verification, then you and your spouse can get the discount on-line or at the store. My wife was in Florida and the only proof she needed was our home phone number. Home Depot says they can't do that. I went to Home depot in Ft. Myers yesterday and bought over $100.00 worth of lumber and a Home Depot pencil. I presented my Disabled Veteran ID card and was given a 2 cent discount for the pencil only, they don't give a discount for lumber. I will be going to Lowes.